For farmers, ranchers, ag professionals, resource specialists, conservationists, soil scientists, students and educators. The Soil Biology Primer is an introduction to the living component of soil and how it contributes to agricultural productivity, and air and water quality. The Primer includes units describing the soil food web and its relationship to soil health, and units about bacteria, fungi, protozoa, nematodes, arthropods, and earthworms. The Primer was originally produced by the NRCS Soil Quality Institute. It is now published by the Soil and Water Conservation Society (SWCS). How to order: Order from the SWCS web site at http://www.swcs.org/ (click on Publications and then Books), or call 1-800-THE-SOIL, or e-mail pubs@swcs.org. 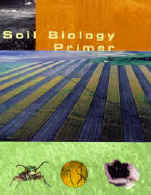 About the on-line version: The Soil Biology Primer was originally published as a 50-page booklet. The on-line version below includes all the text of the original but not all the images of soil organisms. The full story of the soil food web is more easily understood with the help of the illustrations in the printed version. Original cover as published by NRCS. Copyright restrictions: Many photographs on this site cannot be used on other web sites or for other purposes without explicit permission from the copyright owners. The text, graphs, tables, and photos from USDA sources may be used freely, but please credit the Soil Biology Primer or this web site. Also, as a courtesy, e-mail the webmaster of this site to let us know how you are using this material. The Soil Quality Institute of the Natural Resources Conservation Service, with assistance from the Conservation Technology Information Center, provided leadership for this project. The Natural Resources Conservation Service and the Soil and Water Conservation Society thank many individuals, including the following, for their contributions. Tugel, A.J., A.M. Lewandowski, eds. (February 2001 -- last update). Soil Biology Primer [online]. Available: soils.usda.gov/sqi/soil_biology_primer.htm [access date]. Tugel, Arlene, Ann Lewandowski, Deb Happe-vonArb, eds. 2000. Soil Biology Primer. Rev. ed. Ankeny, Iowa: Soil and Water Conservation Society. Tugel, A.J., A.M. Lewandowski, eds.1999. Soil Biology Primer. NRCS Soil Quality Institute, Ames, IA.